Michigan home experts say “Water always wins” because water has a way of finding its way through even the smallest cracks. This means water damage can go undetected for weeks or even months, causing wood to rot and leading to serious structural damage, especially in basement flood damage situations. In porous substances like drywall and even concrete, mold starts to grow within 24-48 hours of water damage. The key to winning the war on water is to get help fast! 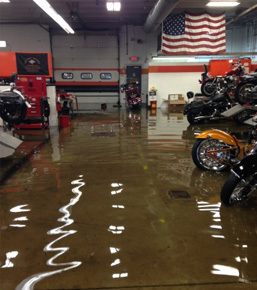 If you’ve experienced a basement flood or water damage, call DRYmedic first and avoid a bigger problem. DRYmedic® is certified in Michigan through IICRC and NAMP to provide professional mold remediation and removal services. Fastest Response in Michigan: Expert Help Within 1 Hour! When you call DRYmedic, we send a remediation team out right away. Our water damage experts are equipped to handle everything from residential basement floods to commercial water main breaks quickly. We keep you up-to-date on your project at all times. As part of the process, we will provide you with all of the necessary documentation for your insurance provider. DRYmedic® assists businesses and families all over Southeast Michigan with their fire damage restorations, water damage repairs/extractions, and mold remediation. Many of our customers come from Southfield, Farmington Hills, Milford, Pontiac, Holly, Rochester, South Lyon, and the surrounding area.